Dr. Gregory K. An is a Board-Certified Endodontist and a Diplomate of the American Board of Endodontics. Dr. An grew up in the bay area and completed his undergraduate studies at University of California, Berkeley. He earned his doctoral degree at University of Michigan, Ann Arbor. He then completed a residency, fellowship, and masters degree program at Harvard University. For the following seven years, he served as the program director of Geriatrics at the Harvard School of Dental Medicine and faculty in the Division of Aging at the Harvard Medical School. During that time, he was selected as one of the top ten new dentists by the Massachusetts Dental Society for his impact on the dental profession. 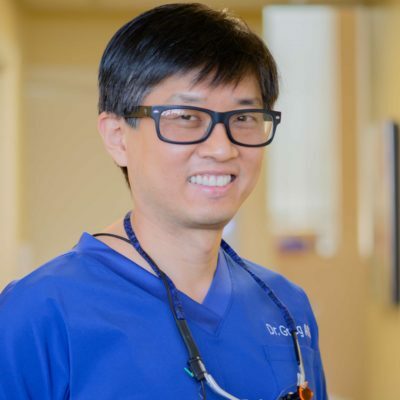 Dr. An’s commitment to helping patients maintain their natural teeth and his interest in root canal therapy led him to pursue specialty training in endodontics. He completed his certificate of specialization in endodontics at Lutheran Medical Center’s hospital-based program in Brooklyn, NY. Throughout his education and faculty appointments, he has received numerous honors, awards, and research grants. As lead author, he has published several papers in high-impact refereed journals such as the prestigious Journal of Endodontics. Dr. An is an active member of the American Association of Endodontics, the College of Diplomates, and the American Dental Association. Outside of the office, he enjoys spending time with his family, traveling, playing jazz saxophone, and watching football, especially the 49ers.